Cunard has announced an update to its dress codes, describing it as a “loosening of ties” on non-formal nights. Why has it decided to make the change? And from a wider point of view, why are there dress codes at all on cruise ships? 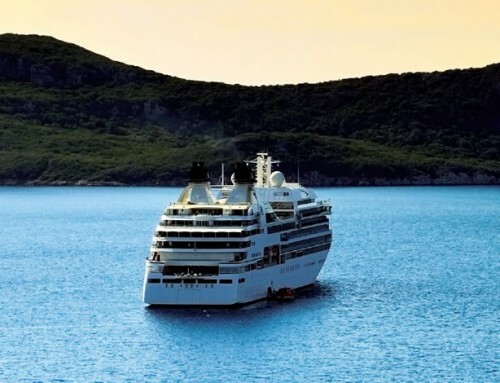 When I embarked on my first cruise not far from two decades ago, I welcomed the opportunity to dust off my dinner jacket and pull on a bow-tie (elasticated and pre-tied, by the way – I have never mastered the art of doing it myself). On one memorable Transatlantic crossing aboard Queen Elizabeth 2, every night was a formal night, with the exception of the first evening after leaving Southampton and the last night before arrival in New York. Nowadays, I must admit, the prospect of squeezing a DJ – or tux, if you like – and formal suit into a suitcase which is already straining to meet an airline’s stingy weight restriction has become an irritant. Especially when the suit might be required only once during a 12-night cruise. And that’s without taking into account Mrs Greybeard’s extensive wardrobe of glamorous ballgowns and cocktail dresses. Do you know how much all those sequins weigh? Not to mention the collection of Louboutins and Jimmy Choos, plus matching handbags, of course. How many people even own a dress suit these days? And how many can be bothered to hire one to take on holiday? Trouble is, once people are given more choice about what to wear, it all starts to get a bit chaotic. Look at the anxieties caused when “dress-down Fridays” became popular. Freed from the obligation to wear a suit to the office, workers either spent a fortune on a new wardrobe, or panicked. Would jeans and T-shirt be too casual? Will my mates laugh at me for wearing regulation chinos and a V-neck jumper, or dare I wear my raspberry crush corduroys? It was all too much of a hassle. The majority of cruise lines now accept a dark “informal” suit, preferably worn with a tie, for wear on so-called formal nights. On some ships, passengers are reluctant to even go that far and there’s a growing acceptance of casual wear in main dining rooms whose head waiters would otherwise have banished scruffs to the buffet. Elsewhere, and on less formal nights, gentlemen will still be expected to wear a jacket, but can dispense with the tie. President and managing director Peter Shanks said: “The glamour of dressing to the nines is a hallmark of travelling with Cunard, and distinguishes us from the mass of cruise operators where dressing up has become a thing of the past. “In a world where everything seems to tend towards the casual, Cunard is proud to give passengers the opportunity to put on their best bib and tucker and really shine. 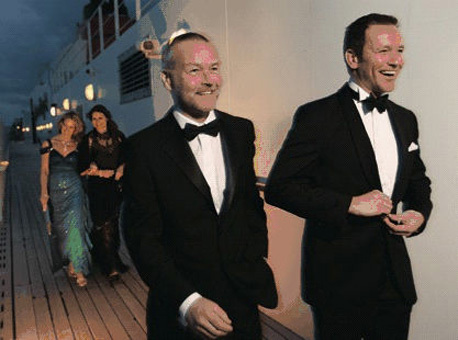 Dressing up heightens anticipation and brings an extra special sense of occasion to an evening at sea. Our passengers tell us it makes all the difference to their enjoyment of a big night out on board. Is everybody happy then? I’m not so sure it’s a huge difference at all. But I am still relieved that ripped jeans and cut-off T-shirts will be unwelcome in the Britannia Club restaurant – or indeed any other dining room – when I travel on Queen Elizabeth next month. The 12-day cruise to the Canaries will include no fewer than FOUR formal nights, including a Cunard Ball, London Ball, Elizabethan Ball and a Starlight Ball. In addition, there will be two semi-formal evenings and six elegant casual nights. I’m expecting an anguished cry of “I haven’t got a thing to wear” from Mrs Greybeard any day now. You’re a brave soul for raising this question, John: on the on-line cruise forums threads on dress codes degenerate into insults faster than anything else. I have a dress suit, and I very much enjoy wearing it, but formal nights on cruises are pretty much the only time when I do. It was bought for our first cruise, a fly-cruise with MSC in 2005. However for the last four years we seem to have cruised exclusively ex-UK, which makes lugging the clothes around much easier, of course. It’s also the case that I work from home so theoretically I could stay in my PJs all day, every day; cruises are pretty much my only opportunity to wear smart clothes in public, and I enjoy doing so. That said, I do recognise that I might think differently if I was wearing a smart suit every day and perhaps entertaining clients, etc, regularly. In that situation I might indeed just want to stay casual when I was on holiday. Nonetheless, I have to say that among my fondest memories are formal nights in the big dining room on Celebrity Solstice – a big, dramatic two-tier space, decorated very monochromatically, but brought to life by the combination of the men in their dinner suits and the ladies in beautiful dresses of all colours in the rainbow. Smashing. I too love to dress up and have the chance to wear a long gown and see my “other” half in his best bib and tucker:) I agree it should be everyones individual choice as to what they want to wear on formal night. If they prefer to dress down, yes they should be seated in other dining areas, which is not to say they are being banished to the pub or somewhere else, but I agree that out of respect for those like myself that like to do the full on glamor thing, lets still keep the main dining rooms formal on formal night. I love the opportunity to Dress up, there are very few occasions when you can do this these days. I booked Cunard because I thought the were one company that were still maintaining high standards of dress code. I have just found out that there is only one formal night on my 7 day cruise,I am quite upset. Even the more informal cruise lines usually have two. If you don’t want to dress formally there are plenty of other place on the ship to go to and not vice versa.Very disappointed! My wife and I were on the qm2 in its inaugural year, we took our 3 children with us on the transatlantic crossing to New York, and even the children loved the formality of the 3 or 4 formal nights, it’s one of the reasons we wanted to experience Cunard. My wife wanted to recreate the xperience so this year 2017, after the re-mastering, she is a little upset that on an eleven night cruise, there is only 2 formal nights, and I have to admit, it is more difficult for myself, since I shall have to take more informal jackets etc for the remaining 8 evenings. I do not see this as helpful, particularly since we have to fly to Singapore to join the ship……! I’m afraid I do not know any lady who wishes to use Cunard, who would not be delighted to dress spectacularly every evening, is nothing sacred anymore? Why does everyone have to cater for the lowest common denominator…..l!